Swipe right for a handsome stud on Tinder and help save an entire species! If you’d like to meet the “world’s most eligible bachelor” and help an amazing conservation cause all in one swipe to the right on your Tinder account, then you’re going to love this. Meet Sudan, the last male northern white rhino in the entire world. He’s got a lot of love to give, but considering the dire situation he finds himself in, there isn’t a lot of time for that lovin’ to happen. Sudan is a handsome older man, but at 43 years old, he spends a good portion of his day—actually, all of his day—under armed guard. This wonderful fellow needs to have protection to make sure that the poachers who’ve hunted his kind near to complete extinction can’t get to him, too. This involves a lot of money, effort, and time, and even placing imbedded-transmitters in his horn, which is kept short to dismay potential poachers. And while Sudan is the last male northern white rhino in the world, it doesn’t have to be lights out for his species just yet. There are two lovely ladies who are just gaga over him but try as they have in the past, Sudan and the two remaining female northern white rhinos just haven’t had any luck getting pregnant—though it’s not for lack of trying! 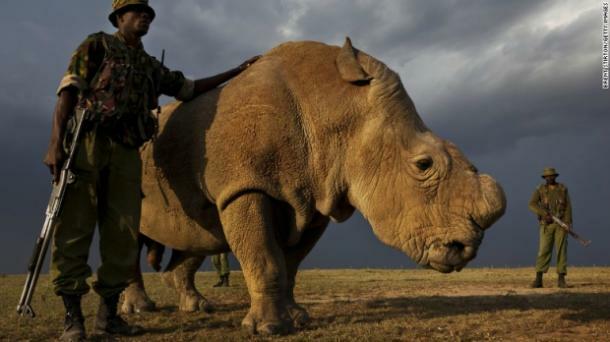 Sudan, stud that he is, is nearing 44 years on this earth, and for the last male of his species, there’s a lot of pressure on him to help revive the northern white rhino name. Enter Tinder into the picture. The folks behind the "hookup app" have decided to help this awesome rhino and his lady friends by giving him special privileges to have an account on the dating app. 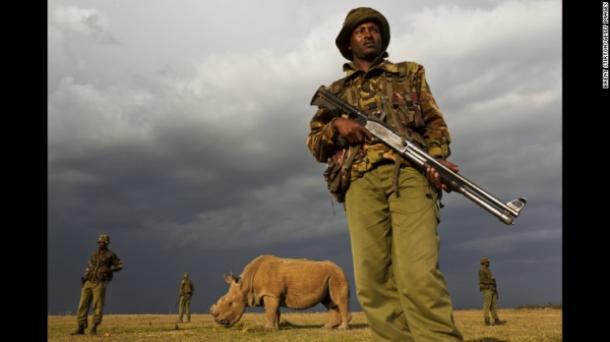 In conjunction with the conservation where Sudan lives, the Ol Pejeta Conservancy, they’re seeking to raise enough funds to have a full round of in-vitro fertilization (IVF) to help push the northern white rhino numbers back out of extinction. In addition to their collaboration, they’ll use a communications agency, Oglivy Africa, in order to broadcast his amazing Tinder profile to 190 countries in 40 different languages, all around the globe. And he isn’t kidding, either. The company is hoping to get to the huge goal of $9 million dollars to make these conservation efforts really work. Northern white rhinos have been endangered for a long time because of poachers killing them over their horns, but as of 1960, there were still around 2,300 left in existence. Now, thanks largely to humans, there are three. This means that in the past 50 years, humans have helped decimate their population by 99 percent. So it also falls to us to protect these amazing creatures and help rebuild their species. If you’re lucky enough to match with this dapper older gentlemen’s profile by swiping right, you’ll be directed to a site where you can donate funds to help Sudan repopulate those dwindling rhinos. This will also have the added benefit of increasing the number of beautiful baby rhinos in your Facebook and Twitter feeds in the very near future. The US team has already raised over $25,000, which is a great number, but they could always use more! So, you get to meet a great guy on your Tinder profile, swipe right, and help the continuation of an entire species! Honestly, that’s probably the best possible outcome anyone could ever hope to have from a Tinder encounter.